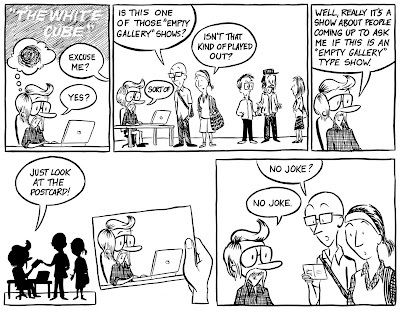 Which is to say I think there will be more strips about art genres.You might mention any of particular interest (Teutonic Photography,Endurance Performance, Mirrors and Other Shiny Things Children Like, Art by People Who Wish They Were from Winnipeg, etc.) in the "comments", and I will see what I can do. Also, congratulations to Luanne Stovall for guessing correctly in re: Ad Reinhardt, the Greatest American Artist of the Twentieth Century.